After a long and wild game between Wang Hao (China) and Gata Kamsky (USA), we now know the name of the winner of the rapid competition. The Chinese player, who had led since the beginning of the tourney, could possibly miss the 1-st place if he lost the game. And he was very close to it. 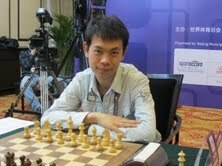 But Wang Hao was the strongest and the luckiest player of this rapid. He defended a very tough position and finished the tournament in sole 1-st place with 5,5 out of 7. Congratulations for the Chinese player! Half a point behind in second place was Vugar Gashimov (AZE). Gata Kamsky is 3-rd with 4,5 points. We are grateful to all the players for this great show. Tomorrow they compete in the blitz tournament.